Coca-Cola accidentally leaks list of tour dates for its Christmas truck! Holidays are coming, holidays are coming... Coca-Cola has accidentally leaked a list of tour dates for its Christmas truck. 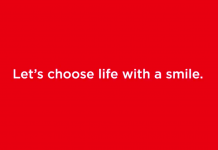 Coca-Cola’s heart-warming short film, ‘Choose to Smile’ will make you laugh! To mark the launch of a new campaign by Coca-Cola that is inspiring people to Choose Happiness, the brand has created a new heart-warming short film.